A Romantic Vintage Lover's Dream! Designers at The Wardrobe Shop have reworked the idea of 1920's, 30's and 40's styles to compile a stunning collection of must-have dresses for your vintage inspired wedding. Think ruffles, beautiful embroidery and dazzling embellishments. They truly captured the romantic feeling of a time passed. There are so many vintage style dresses that would be perfect for your wedding or rehearsal dinner dress. They even have an entire section recommended for second weddings. Their collection of antique style dresses is so extensive that you will easily find that unique bridesmaid dress you are on the hunt for, or that special mother of the bride dress. Since opening their doors in 2003, The Wardrobe Shop has become the go-to boutique for brides in search of soft and romantic vintage style wedding dresses.Their team is incredibly friendly and courteous with a full staff of consultants, ready to help you make your vintage inspired wedding dreams come true. As for the ones responsible for designing their stunning collections, Nataya has built a very loyal following over her 15 year career, having dressed celebrities, debutantes and lovers of romantic vintage the world over. Here is just a taste of all their prettiness. You are going to love the wide variety of interesting styles, cuts and fabrics they have used. They even have vintage style coats, pants and tops. 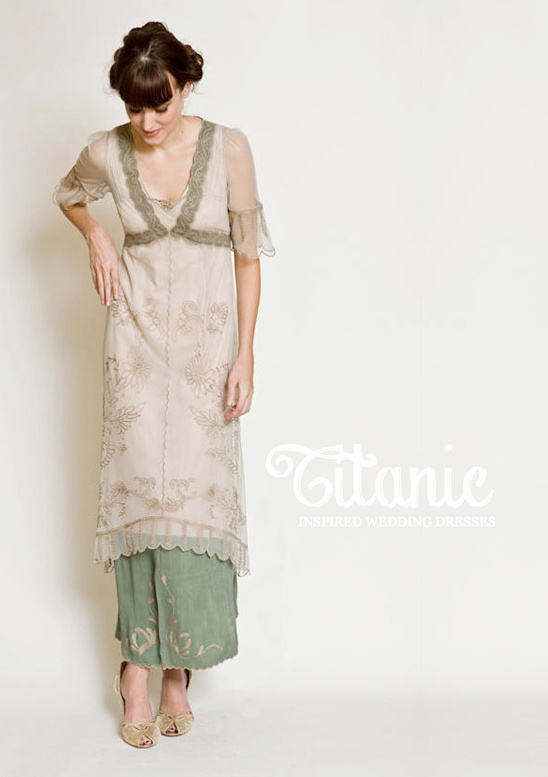 One thing that cannot be left without mention is the style for which the Wardrobe Shop is truly know - Titanic inspired dresses. The beautiful empire styles are versatile and is a fantastic alternative for second time around brides as well as their mothers.